Moving to cloud-enabled solutions means IT Professionals and Developers need a deeper and broader set of skills, and they need to be current on the latest technology solutions. As cloud-enabled solutions transform IT in organizations, it is important for technology professionals to enhance their on-premise skills to unleash the potential of Microsoft technology solutions. That’s why Microsoft has reinvented its certification program—to certify a deeper set of skills that are mapped to real-world business context. Rather than testing only on a component of a technology, IT Professionals and Developers are now tested on more advanced skills and a deeper understanding of the technology. And just as Microsoft continually updates the certification exams to cover the latest skills, certified professionals will be required to recertify every two to three years. 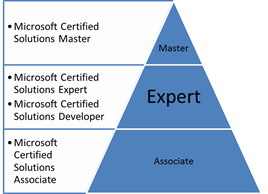 The Microsoft Certified Solutions Associate (MCSA) level is the prerequisite certification necessary to get the Expert level certification. The Microsoft Certified Solutions Expert (MCSE) is Microsoft’s flagship product for those who want to lead their company’s journey to the cloud. It is the destination for established IT Professionals who have expertise working with Microsoft technology solutions. The Microsoft Certified Solutions Developer (MCSD) is the destination for established Developers who have expertise developing solutions with Microsoft tools. After people have achieved their Expert level certification, Microsoft Certified Solutions Master (MCSM) is for the select few who wish to further differentiate themselves from their peers. 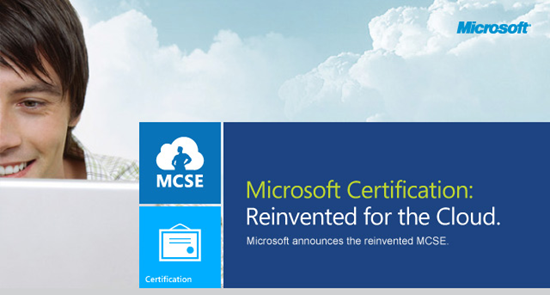 To learn more about Microsoft Certification Paths Go to MCSE overview page.